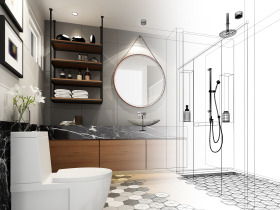 Almost three-quarters (71%) of UK homeowners wouldn’t know where to start if they wanted to complete a bathroom refurbishment, new research has revealed. The survey, completed on 1,100 consumers by DigitalBridge, found that just 5% of people would feel extremely confident in knowing how to go about beginning the process of refitting their bathroom. By contrast, 57% of homeowners said they would feel very unsure, and 14% even stated they would have no idea whatsoever where to begin. Of these, almost two-thirds (64%) believed that this uncertainty would delay them starting a project. Interestingly, despite the experience that age brings, renovation uncertainty was most prominent amongst 55-64 year olds and least common amongst 25-34 year olds. Almost one in five (19%) of the older age bracket admitted they would have no clue about how to go about having a new bathroom fitted, but this figure dropped to 12% amongst the millennial generation. A further 74% of people would have very little or no idea about how much a new bathroom would cost to purchase and fit. Conversely, just 8% of people said they would have a very good idea. CEO of DigitalBridge, David Levine said: “These figures suggest that bathroom retailers are potentially missing out on millions in sales due to general lack of consumer awareness around how to implement a renovation. “Interestingly, life experience is little help, with younger consumers appearing to be more knowledgeable about the renovation process than their older counterparts – perhaps due to a greater tendency for this age group to use online search and digital tools to inform their thinking.